Let your little ones and teens get creative at our creative kids classes and Private events offered. We offer different open classes for all ages, each class specializing in different types of mediums, such as drawing, painting, hand building with clay, ceramics, and mixed media projects! Check out our online calendar for open kids and teen classes! 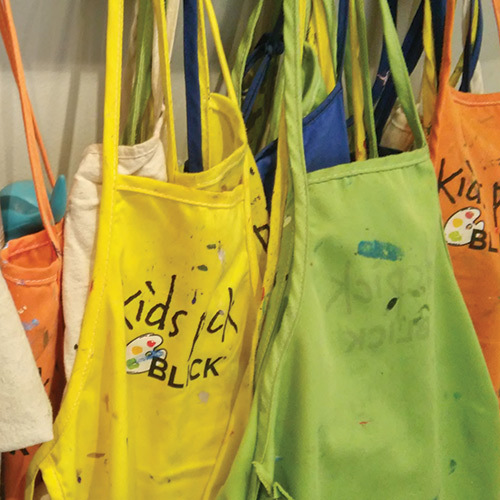 All classes include quality art supplies, instruction, snacks and FUN! Our ceramic studio is open to the public Wednesday-Sunday for anyone to stop in and create! Choose from canvas’s or ceramic pieces to get artsy and creative with! Check out our awesome themed art camps for your creative kiddos, below! Calling all Pirates and Mermaids! In this camp, students will be walking the plank, making their own pirate swords and mermaid wands, and will be inspired by the ocean and all things beachy! Students will use sand, seashells, and water to express themselves through art. Your littles will experiment will all different mediums, including clay and pottery! Eric Carle inspired "In the Garden"
Students will tune into their outdoor creativity, as they create art with plants, dirt, bugs and fairies! This camp will be filled with hands-on, sensory crafts and activities inspired by nature, and the gestural artwork and stories of Eric Carle. We will be making collages, painting and filling flower pots, and of course inspiring them to create their own art with an endless amount of mediums for them to choose from! In this camp, students will be inspired by unicorns, dragons, and far away lands! Students will be carried away by the world of make believe, as they build their own castles, and create with an array of different mediums. In this camp, students will learn about the elements and principles of art through a variety of fun projects! Budding artists will have the opportunity to work with unique mediums and tools to gain a fundamental understanding of various methods of art making. As each student explores drawing, painting, mixed media/design, sculpture and print making, kids will build their self-esteem while strengthening their skills through every day art. This camp will encourage artistic exploration by focusing on a different artistic discipline, each day! Students will work one on one with our talented artists, as they create their own masterpieces using their own artistic abilities. Students will create their own original, inspired large scale artwork on canvas while also exploring ceramics and hand-building classes. This is a great camp for portfolio building! In this full day art camp, students will learn about the elements and principles of art through a variety of fun projects! Budding artists will have the opportunity to work with unique mediums and tools to gain a fundamental understanding of various methods of art making. 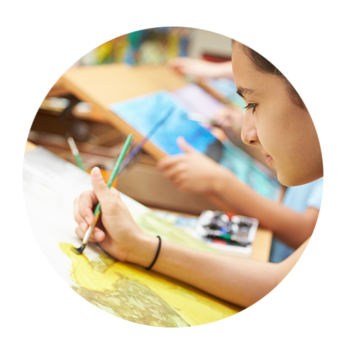 As each student explores drawing, painting, mixed media/design, sculpture and print making, kids will build their self-esteem while strengthening their skills through every day art. *Full day campers will need to bring a bag lunch Monday-Thursday* Snacks and drinks are provided each day! Tap into creativity while painting on canvas, drawing with pastels, charcoal, inks, experiment with sculpture, and a variety of hands-on art projects and diy projects. A $75 deposit is required upon booking to hold your child’s spot (you will receive a confirmation email once you book). All of our camps are small (12 kids max), so we can spend more one on one time creating with your child! We know parking can be difficult downtown, so you won’t have to get out of the car! After the first day of check-ins, we ask parents to simply pull up to the door for drop off and pickup, and we will all be waiting for you!